How does refer and Earn Work? Invite your friends with a unique referral link. Your friend accepts the invitation through link, Sign up on Homebethe & completes their first purchase worth at least Rs 999/-. Once order has been delivered successfully. You both will get 200 HBCash Credit in Your HBCash. How can I refer Homebethe.com to my friends? Login to your Homebethe account on the website with a desktop or app on your mobile. On Website click in My Account, you will find Refer & Earn in the My Account Menu, on Mobile App click at the Sidebar menu >>Refer & Earn. Use your unique Referral Link to invite your friends and ask them to sign up using your referral link and complete a purchase of Rs 999/-. Post your friends order on Homebethe is delivered meeting all criteria, both of you will receive 200 HBCash credit. How does my Friend/Referee use the referral link? Once you have the Unique referral link via referral invite go to homebethe.com or click the signup link received with the invite and Fill this referral link on the signup/registration page. Post this press the signup button and complete the purchase of minimum Rs 999/-. 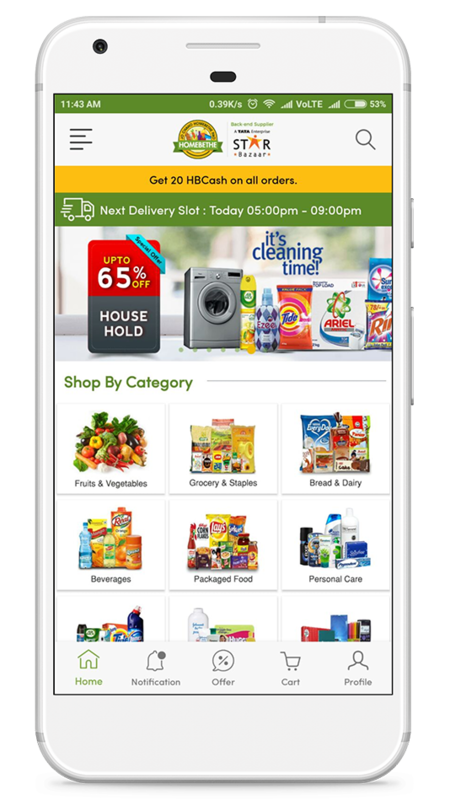 Once your order is delivered Homebethe will check if all the required conditions are met and within 24 hours both of you will receive the HBCash of 200 each in Homebethe wallet. You can use this in any future purchases with Homebethe. Why did I not get reward for an invite that was accepted? There is a wallet inbuilt on Homebethe for every user. Your referral reward will be credited there so you can use it for any of your future transactions on Homebethe. The reward will get credited within 24 hours after your friends order delivery is completed. The user clicked on your link didn't used your link on signup or completed their first purchase. The total order value (excluding delivery charges, specialty store items) of the first purchase was less than Rs 999/-. The referred member placed an eligible order, but the order was cancelled. Our fraud detection system pointed to the referee as an existing customer or any other fraudulent activity. Referrer is a person who is an existing customer of homebethe, Referee is a person who is introduced by referrer. The Refer and Earn Program is only valid on new installs and sign up on mobile apps and Only New Registration on Website. This offer will not be valid for existing users who already have registered/signed up on homebethe. Each unique referral on their first order from homebethe is eligible for 200 HBCash only once upon order completion from referee. Offer is valid on minimum transaction value of Rs 999/-. If the referred customer places the first order below Rs 999/- it will not be counted as successful referral. Offer Applicable only once on App Download on Unique device/or on Unique registration details (email & Mobile No. Web). A sign up with a different email address or phone number using the same device will not qualify as a valid referral on App. If one person is referred by 2 person, only the link used first will be considered for referral bonus and not both. Homebethe may suspend or terminate the Refer and Earn program or any user's ability to participate in the program at any time for any reason at their discretion. Bonus cash earned as a result of fraudulent activities as determined by our fraud management system will be revoked and deemed invalid. Bonus cash earned using the referral program cannot be withdrawn into any of the payment instruments like Bank account, Credit Card, Debit Card etc. Homebethe reserves the right to amend these terms and conditions at any time without any prior notice. Modifications of these terms will be effective from the time they are updated in the Terms and Conditions section. For all other queries please email info@homebethe.com.